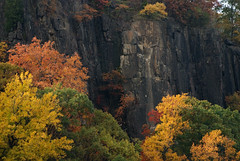 The Palisades Interstate Park follows the west bank of the Hudson River from Fort Lee at the base of the George Washington Bridge to the New York State line and beyond where it blends with other parks in the Palisades Park System. The New Jersey portion of the park contains 25 plus miles of hiking trails that follow both above the cliffs of the palisades as well as below along the banks of the Hudson. 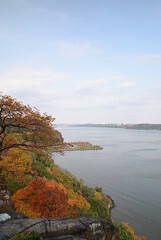 Inside the park are many historic locations and lookout spots for sightseeing across the river at Manhattan, the Bronx and points north, and other interesting points such as series of year round waterfalls. Hikes in the park can be quite leisurely, to rather strenuous if a route is chosen that leads between the 13 mile aqua blazed Long Path above the cliffs and the 12+ mile white blazed Shore Trail below. Parking areas and picnic areas are scattered throughout the park and accessible by major roads offering many planning options for distances, exploring, or just stopping in to check out the view. The park can be accessed via public transportation (buses) out of New York City that stop just on the NJ side of the George Washington Bridge, or by car along Rts 1 & 9, the Palisades Parkway or other points from Fort Lee through Englewood Cliffs and up through Alpine. The Palisades Parks Conservancy is a non profit organization that teams with the Palisades Interstate Park Commission to care for, publicize, and promote usage of the park and related surrounding parks such as Bear Mountain. Park maps are available for download from the NJ Palisades site. Printed maps are maintained and sold by the NYNJ Trail Conference, or Amazon.com. An 8 mile, 5 mile, and 6 mile hikes are described on the NY-NJ Trail Conference site. 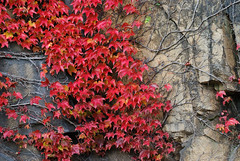 Photos of this park taken by Chris Casciano. Photographs from parks and trails around New Jersey can be purchased at New Jersey Landscape Photography by Chris Casciano. Buy a print to support this site and take home a memory of the trails. Directions to a number of convenient entrances to the park, including the Fort Lee Historic Park at the south end of the trail, are listed on the NJ Palisades directions page. or click on the map below for a link to Google Maps.